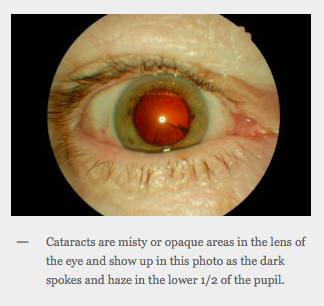 Cataracts start as cloudy spots within the lens of the eye and gradually progress until the lens becomes too cloudy to see distinctly. They are simply a description of the natural aging process of the lens and are not a skin or growth. There is no urgency to remove cataracts until they start to become annoying. When they reach this stage we will refer you on to eye surgeon that specialises in cataract surgery. Cataract surgery involves removing the lens of the eye (these days it is now broken up in situ and the pieces sucked out through a very small (2mm) opening in the cornea. A rolled up replacement lens is inserted through the same hole. It unrolls itself and all the instruments are pulled out The small cuts seal themselves and vision is restored as soon as all the drops wear off. The operation is usually performed with a local anaesthetic and lasts about 20 minutes. One big advantage of cataract surgery is that the inserted lens can be calculated to remove much of any pre-existing distance vision problem. Many people find themselves less dependent on glasses than they have been at any other time of their life. Glasses for reading are still usually required.